BBC NEWS | Have Your Say | Should BBC have shown Jerry Springer opera? A Christian prayer group, Christian Voice, will bring a private blasphemy prosecution against the BBC after the screening of Jerry Springer - The Opera on Saturday. The show depicted American talk show host Jerry Springer meeting transsexuals and a troupe of tap-dancing Ku Klux Klansmen. The BBC has defended its decision, saying that as a public service broadcaster it should provide programmes that appeal to the differing tastes and interests of people in the UK. Do you think Jerry Springer - The Opera should have been broadcast by the BBC? Is Christian Voice right to object? Is the BBC's justification valid? Did you watch it? Send us your views using the form on the right. Is the BBC right to broadcast Jerry Springer - The Opera? Are the Christian organisations right to object? I am happy that the BBC screened this performance. I am a licence payer and I am perfectly capable of deciding what to watch on TV. If people do not like this performance they should watch something else. What we are dealing with here is not merely an offence which Christians should ignore, it is gratuitous blasphemy. Granted, it is not possible to avoid offence to everybody, but it is very possible to avoid outrage. Blasphemy is not something that Christians can ignore, but, for the sake of God's name, must stand against. True free speech involves being responsible. No-one can be free to say anything one wants. No-one has the right to insult anyone's religion. The BBC should not hide behind the bleeding heart, arty farty liberals. The opera should not have been broadcast. The BBC's reasons for broadcasting have been ill thought out with no regard for the direction of standards. When people protest, they are not being bullies they are simply exercising their right to freedom of speech. They are also stating how offensive it is to have those they revere treated in this way. I wonder if the directors would allow their mothers to be besmirched publicly in this way? Why should the BBC ignore a record number of complaints from Christians, yet uphold far fewer objections by Sikhs on a similar matter? If we start censoring ideas where will we be? There is a huge irony here - 47,000 complained about the programme before they had seen it - therefore they must have been offended by the idea of it rather than the actual show. If we start censoring ideas where will we be? Also, if any of the complainants did go on to watch it, they did so knowing they would be offended by it and so only have themselves to blame. Personally, what I find offensive is the censorship of my TV viewing by the fundamentalist Christian right. I only caught the end of the opera (last 30 minutes) but I thoroughly enjoyed it! I understand that it may upset some people, but there's a little thing called freedom. Just because it upsets some people does not mean it shouldn't be shown. Please, please, please, please, please, could the BBC repeat the showing of Jerry Springer - The Opera. Here in Carlisle we were looking forward to seeing it but were prevented by floods and power cuts. The BBC should not put on this type of insulting and disgraceful programme. It is in very bad taste. 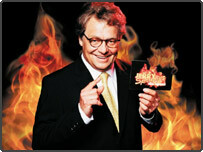 I totally support Christian Voice`s objection to the Jerry Springer the opera. I am disgusted that the BBC should choose to broadcast such an offensive work. I am impressed that the BBC did not cave in to pressure and withdraw the programme from broadcast. Well done. I enjoyed it. I might have missed it if not for the protests on the news. The BBC probably would not have broadcast the show if it were Mohammed being portrayed in a nappy. Why offend Christians by disrespecting their beliefs? We go from serving the client to spitting on the client. This show is a hate crime against the majority of the people in this country. It really shows how intolerant the BBC is. I am disgusted. What I find extraordinary is that the theatre show in London has been running since 2002 and has not had a single complaint. So why all of a sudden is this programme classed as being unacceptable? I am dismayed by yet another TV programme which debases humanity. It calls to the lowest of our nature, instead of the highest which is in each of us. So-called reality TV, and shows in the same ilk as Jerry Springer do nothing to raise the human spirit. The money I spend on a TV licence is hard earned, and I really do object to it being spent on such trash. Why couldn't the writers have put their talents to something more uplifting and joyous than this? I didn't really find this offensive, just plain rubbish! I think it's a shame when a programme like this gets publicity for its use of swearing and everyone ignores the fact it was just a bad programme. Do people not realise if they just switched off no-one would bother watching, but by highlighting the offensive aspect of the programme they encourage people to watch 'just to see what all the fuss is about'! It always amazes me when people say "how dare they spend my licence fee on this? ", as if their contribution is more important than everyone else's. If the BBC refused to spend licence payers' money on any show that someone may object to, the screen would be blank 24 hours a day. I don't watch soaps or DIY shows but I accept that they must be broadcast as someone out there wants them. I'm just glad that in this instance, they put on something that I thoroughly enjoyed. Shakespeare had to work in an environment of religious political and puritanical censorship. He managed to write plays that are still creative, thought-provoking, entertaining and popular 400 years later. I think the writers, Richard Thomas and Stewart Lee are using bad language and blasphemy to conceal their lack of creativity and talent. Two warnings were given before this programme therefore that would indicate that the programme was going to contain sensitive information. Why do people need to complain when there was more than sufficient warning and background information with regards to this programme before it was aired? I very much enjoyed "Jerry Springer - The Opera" and hope the BBC will continue to show quality programmes such as this. In my view, it highlighted the dubious nature of reality TV. Music and singing fantastic. I am extremely offended by the portrayal of Jesus Christ. A person's religious belief is a fundamental human right and others should have the courtesy to respect their belief. The BBC take my licence fee and I feel that they have abused my rights by broadcasting this programme which portrays the image of Jesus Christ in this disrespectful manner. I tried it, I lost interest in it, I switched over to the football. No problem! I do suspect the BBC wouldn't have broadcast anything similar in regard to another religion but most Christians should take heart from the fact that their religion and belief system is robust enough to withstand this. After all, 40 thousand complaints represents only a fraction of Christians, never mind the population. I found the Jerry Springer opera great fun and thought provoking as a bonus. It is exactly what I expect the BBC as a public service broadcaster to have the resolve to broadcast. In my view those special interest groups that deride it should really consider the importance of freedom of expression above their own narrow interests. Keep on broadcasting challenging work BBC. I thought it was excellent and I take my hat off to all those involved, I really really enjoyed it. So thank you BBC for bringing us something different. I am a committed Christian, but it wasn't HOW Jesus was portrayed that offended me, it was the whole idea of mocking my religion. The BBC is paid for by everyone, so should not air programmes like this which will offend millions of people. May I just point out that some of the people objecting to this broadcast did not do so solely on religious grounds. Although I found the material blasphemous, my biggest objection was the constant vulgarity. It seems a major selling point was the volume of bad language and the sheer ribaldry of it all. A new level of depravity indeed for the BBC. I watched a few minutes of the Springer Opera. I found it extremely offensive. The BBC has sunk to an all time low. The corporation would not have dared offend other religious groups in this country - the government would probably have intervened anyway before any similar broadcast affecting another world religion. Very poor show BBC. One thing that puzzles me about this whole business, why all the fuss now? And about this show in particular? This show has been running at our National Theatre (that's publicly subsidised, fact-fans. From taxation I might add, rather that the TV license we choose to pay), and comparatively speaking nobody batted an eyelid. Is it because people fear it is too much responsibility for most of the population to make their own viewing judgements? Is it because the moral minority is emboldened by the success of their counterparts across the Atlantic in recent times? No is the simple answer. If people want to watch this type of entertainment, can it be at their expense, as I do not think it should be supported by the BBC at my expense? The right to free speech does not discriminate between beliefs. It is, as it suggests, a right to say what you like. You do not have to like or believe what you hear/see but you should welcome the right to hear/see what you want - whatever your taste. The BBC is a public service provider and therefore has to appeal to all tastes. I personally do not like religious programmes but that is my opinion, I do not expect the BBC to take them off air. I would like to congratulate the BBC on showing the programme. It is important that the BBC is able to make decisions that are not subject to external censorship or bias. The BBC has my full support in this matter. Well done the BBC for not buckling under pressure from a minority of license payers. Despite the cries of the contrary by those against the showing, 47,000 complaints out of over 60,000,000 people is by no means a majority. How dare the BBC use my licence money to fund the broadcasting of the Jerry Springer - The Opera. I object to a supposedly "committed Christian", who is clearly a hypocrite putting on a piece which if it were aimed at Islam, he would never dare to do. The increasing use of bad language is something we have come to expect from an organisation seemingly run by an arty set that have the self righteous attitude that the masses will take what they are given. This show is a new low in what passes for humour on the BBC nowadays. I am not a Christian, nor a Muslim nor a member or follower of any religious activity, But I still object to trash being paid for by me! Christianity has been around for a very long time and it will no doubt survive unscathed the appearance of a here-today-gone-tomorrow TV show. What is far more fragile is freedom of expression, which must be protected from the high-handed diktats of religious fanatics. Is the Christian religion really so weak, or so pompous, that it will not stand any type of negative comment? After all, they have made enough negative comments about others, including other religions. The BBC is perfectly correct to show it, but I won't be watching it. Simply because I can't stand Jerry Springer, or his show. This is absolutely outrageous. I am sick and tired of the religious right telling us what is and what isn't good for us. I don't force my opinions down your throats. Believe what you want to believe and don't attempt to bully your narrow minded perception of morality onto the rest of the democratic population. It's nothing more that a neo-fascist attempt at media manipulation. Congratulations to the BBC for broadcasting what was an excellent opera. I - a believer - was not in the least bit offended by the material. A (possibly) gay Jesus - what is wrong with that? Careful churchgoers - look to see who is in the pulpit. As for a certain "Christian" web site publishing the names and addresses of BBC executives - shame on you. As believers in love for your fellow man, will you be publishing your own personal details so that the rest of us might correspond with you? The opera made a complete mockery of Jesus, God, and the beliefs of many people in this country. Saying that there is no blasphemy in calling Jesus gay and an all-powerful God needing Jerry Springer's help is a complete lie and cannot be justified. Also, the language is the show was awful, but it was the way it degraded people that was the worst part of it. I am deeply committed to my religion and deeply committed to seeing a secular public space in which all viewpoints can be commented on, heard and judged on their merits. So good on the Beeb for showing it, let's see more quality broadcasts from every viewpoint and not the "tellyban" fanatics. Many thanks for having the courage to show Jerry Springer - the Opera. Laughter, tears, social insight, a bit of camp outrageousness - wonderful entertainment. Not only Christian organisations objected. Many people objected on the grounds of moral decency. The show has already been aired, the BBC will be prosecuted and eventually lose their public charter. I'm not religious and could care less about the portrayal of religious figures in the musical. However I did find the swearing shocking (I must be getting old). That said I would defend my right to be shocked to the hilt. It really annoys me when zealots start whining because they've been exposed to something they don't want to know about, whilst at the same time whining if their freedom to worship is imposed upon. Good work BBC. Utter boredom - but that is not a reason for censorship. I exercised my right to switch off after falling asleep towards the end of Act 1, and after experiencing just a few minutes of Act 2. I cannot believe the BBC, a channel which I have respected for being accepting of all religions, has broadcasted this blasphemous and disrespectful show. I am also appalled that the BBC have not publicised the fact that there were peaceful protests outside their studios across the country on Saturday evening, they have had no problem parading the fact that people who work for the BBC have received death threats for broadcasting Jerry Springer - The Opera. The BBC has lost all the respect I have ever had for them. I believe the BBC should issue an apology for offending so many people (not just Christians) and for broadcasting such a disgusting programme on their channel. Yes, please, someone bring a blasphemy prosecution. It'll be a better laugh than the opera itself - and that's saying something. You should have shown it, and well done for doing so. The only time you should stop is if you are going to be fair to all, and do not show pro-religious programmes. They offend me, but do I complain and burn my license? Or do I switch channels? Anyone who found that this show attacked their beliefs must have some strange beliefs. However the author was clearly making the point that people caught up in the Jerry Springer environment, apart from other behavioural problems, also have a number of inconsistent and absurd notions about their nominal religion. This was an interesting and thought-provoking piece about present-day morality. A pity that the music did not reach a very high standard. Secondly, yes, unworthy aspects of the trappings of Christianity can be mocked in this country because it, and we, are hopefully mature enough to be able to make the necessary distinctions between faith and mythology. By the way, the show did include a panel that specifically stated that it was about mythology. As for the language used, it would probably not have been possible to depict the society targeted if their language had been 'sanitised', as part of the running joke of the show was the inability of the people to use any other form of expression. The BBC is fuelling the growing concept in the UK that Christians do not have a right to protest, and that although other religions are sacred, Christianity is fare game for comedy and entertainment programmes. I am disgusted that a production of this "genre", which is narrowly aimed, gained air time and consent by the BBC. I think the BBC was perfectly right in broadcasting this. Everybody deserves the right to choose whether or not they watch something, and minority groups should not be able to dictate the programmes broadcast to us. Excellent show! Be brave, we need you to keep Britain free. Would be nice though to see some satire aimed at other religions and societies. I am absolutely disgusted that the BBC decided to broadcast this programme.As a Christian I find this programme offensive. It would seem the BBC has gone out of its way to denigrate Christian spirituality once again. I suggest that other West End Musicals such as the Lion King, Mama Mia would have been most enjoyable if they had been screened. The BBC controllers seem to have lost touch with reality and no longer possess an ounce of common sense, but plenty of arrogance it seems. I wish I could revoke my licence fee. As a supporter of the BBC for more than 40 years I am now becoming more and more disillusioned and saddened by the way the corporation is being run. What ever happened to the values of educating and illuminating the public? I'm a Christian, and didn't find it blasphemous. Why is it that some other Christians feel so threatened at the prospect of a particular portrayal of Jesus? And why is most of the media so adverse to representing the differences of opinion about this within the Christian community? For what it's worth, thanks, BBC. If we do indeed live in a democracy then the will of the people should be obeyed. If thousands have expressed the fact that they did not want it aired, then perhaps we should listen to the many and not the few who are always trying to push the bounds of decency to new lows. Living in the United States where the religious right (a very scary bunch!) are beginning to have a say in everything that is shown and outright censorship is just around the corner I would say that you should be pleased that Jerrry Springer - The Opera could still be shown on the television in the UK! There is no way it could be shown on any of the networks here - they wouldn't have the nerve to try to show it. I enjoyed the broadcast. This is a free country and Christian organisations have the right to object as much as I have the right to commend the show. Sufficient warnings of the content were given, both before the show and between Acts 1 and 2, the show was broadcast after the watershed and no-one was compelled to watch it. Well done to the BBC for having the courage to broadcast the production. Yadda, yadda, yadda, all I see here is more rubbish about how we should stand by and tolerate things offensive to our religious beliefs. Muslims don't tolerate it. Neither do Sikhs. Christianity is declining as a world religion because we Christians are allowing this kind of disrespect to go unchecked. I'm a devout Catholic; I watched the Jerry Springer Opera and loved it! All I can say is: He without sin cast the first stone. I am a Christian, but I found this very amusing. It's nothing to be taken seriously. The people at the BBC who made the decision to screen this knew very well that it would cause offence and should not have done so. They will find that this has been taken too far. From my understanding of the content of this programme, I object to its screening at any time of the day. As a committed practicing Christian I am increasingly offended by the treatment of the Christian faith by the BBC. I urge the BBC will to withdraw this programme from its schedule. The alarming thing is that the BBC is dumbing down into tabloid broadcasting and falling into the trap of assuming "if it shocks, it must be good". There is no future in this at all. There is no need for a playwright to craft, to polish and to be ingenious. As a Christian, I doubt that the Creator of the Universe is likely to be miffed, though I confess to being offended. But my licence fee doesn't even guarantee me good reception here in Norfolk, let alone good programme content! Tiresome. I keep reading of people commenting on how offensive things are to Christians. Being a cradle Catholic with some faith doubts myself, what I find offensive is the bullying attitude of some self righteous know it alls who if they truly had faith, really would comprehend that religious truths are more than capable of standing up to momentary media investigation by themselves. The only reason the BBC should not show it is because it is rubbish. The fact that it offends people is neither here nor there - I think the BBC has a creative responsibility to challenge pre-conceived sensibilities, not pander to them. This show sets out to shock and is blasphemous. I will be using the off button but I object most strongly to the BBC spending my licence fee on such a programme. Brevity is needed in my response as if I got wound up I would really let rip. I think the BBC are right to broadcast as they have a duty to cater for the whole nation - inclusive of all religious beliefs. I find the BBC spending my license fee on Songs of Praise offensive but I respect others right to watch it. How can the BBC disregard over 15,000 complaints and still show this filth? As a Christian minister, I would like to express my disgust at the BBC choosing to show on Saturday. The content is very offensive to Christians in this country. I wonder whether the BBC would choose to show a program that blasphemed other religions like Islam by depicting Mohammad as being gay. Why does the BBC have no problem in blaspheming the Christian faith? Also how can the BBC disregard over 15,000 complaints and still show this filth? I for one am disgusted with the BBC over this and I am not the only one. The BBC must not give into this pressure from church groups. I'm sick of religion trying to run our lives. If they don't want to watch they have an off switch like all of us. I use mine regularly on "Thought for the Day" on Radio 4 and anything remotely religious on TV. No censorship! Excellent, thoroughly enjoyed it. Well done BBC - this was one part of my licence fee I didn't begrudge. BBC was right not to give into those who want to limit our religious freedom: it is wrong for others to tell us what we are allowed to believe. I watched it only because they wanted me not to. Many of the complaints about this show fill me with despair, it's depressing to know that so many (50,000 and counting) of my countrymen (and women) are so ignorant. I watched the show, and I saw nothing to offend a literate Christian with a basic grasp of the English language. I watched a satire of modern television and the distortion of society's values by our desire to participate in TV at any cost. The "blasphemy" of act two is plainly not a depiction of Jesus (wearing a loincloth not a nappy) and the devil, but the thoughts and hallucinations of a dying man. Are the complainants unable to understand even the simple plot of a musical? Why should anyone, of any religious persuasion whatsoever, be allowed to dictate what I can watch in my own home? If these people don't want to watch it they don't have to! Well done BBC on an excellent decision (I didn't watch the show anyway, but that's not the point). Religious zealots seem to be making a big comeback in Britain at the moment, unfortunately. I am astounded that over 45,000 people could find grounds to complain about the programme before it was even broadcast - they clearly could not have seen it. If the Opera is that offensive why has it run at various theatres for at least 3 years. It's just coarse, crude and cheap. How can the BBC have sunk so low? I want to know how the BBC justifies showing Jerry Springer - The Opera. Is it to educate us? Hardly. Is it to inform us? Not really. So it's entertainment. And how does the BBC know that viewers want to be entertained by this low-life type of "show"? It's all about ratings, isn't it? Fewer and fewer people are watching BBC, so somebody had the bright idea to show something bound to create publicity and controversy. So far 15,000 people have protested and they clearly don't count. Those who want to watch this sort of entertainment can go to the theatre to see it; I don't want it in my living-room. I don't object so much on religious grounds, Christianity has survived worse than this. It's just coarse, crude and cheap. How can the BBC have sunk so low? Yes, I know where my off switch is. Blasphemous and grossly offensive to Christians. It really does seem that the BBC regard it as OK to insult Christianity in a way that it would not dream of doing to other religions. The BBC was right to show the Opera. It gave plenty of warning so people who might be offended knew not to watch it. Excellent. I cannot praise you more for airing this. I wish you would do more West End shows directly like this - it would cost me £500 or more to get to London and see a show from where I live. I didn't think the music that great but the content - superb and made you think. Tell your protestors to employ their off switches instead of cluttering up the streets and threatening your staff. It was brilliant. Very funny. Anyone who cannot see the funny side of this is clearly missing the point. Good on the BBC for showing this. Not that long ago, BBC executives were shocked at the rapturous reception Pride & Prejudice received at the hands of the viewing public - all without offence to anyone. Why then does the BBC not learn from it successes? The British viewing public is desperate for good, clean fun - not more garbage. I am a Christian and as such I have no right to tell anyone what to watch or broadcast. The choice that I am given is to watch or not. I choose to watch and enjoyed it. To those who complain that it was one less channel to choose from: I hate sport, so Saturday afternoons I don't have any TV to watch. I accept this because sport fans pay their licence, as do Atheists, non-Christians, Opera and Jerry Springer fans. My religion has nothing to do with the BBC and the BBC has nothing to do with my faith. If you felt you would be offended, why watch? If you didn't watch, what right have you to comment? I'm totally indifferent, although a Christian I don't feel I have the right to ask for censorship and the withdrawal of this programme. I just didn't watch - a choice we all had! Having said that, I do have to laugh at the hypocrisy of the BBC whom are quite prepared to stir up a hornets and take the mick out of Christianity, but wouldn't dare do the same against Islam, Sikhism, etc. Haven't we all moved on from the days of Mary Whitehouse and The Life of Brian? If Christian licence fee payers don't want to pay for shows such as this, then I want Songs of Praise, and the Heaven and Earth Show off my TV now! I support the showing of the Opera, I only caught about half of it and I would now like to go and see it performed live! Those that disagree have the choice not to watch. Even though the show contains a great deal of religious and moral aspects portrayed in what might not be a favourable light, in this day and age it can be good to just open your mind and have a sense of humour about these issues. There are more important things to concern ourselves with than bickering over swearing and decency. Freedom of speech brings with it responsibility. I welcome theological debate, but the Opera was not debate, it was abuse. Furthermore it was not done in a private theatre for an audience choosing to pay. It was done on BBC, paid for by me. Don't tell me to switch off when I have paid for it. Many groups are now protected from having jokes made against them so why are Christians excluded from this protection? The show (which I did turn off, offended by the few seconds I saw) was simply a celebration of everything that is vile and sordid. If this wins awards, it doesn't say much for the judges. I didn't even know the Jerry Springer opera was on until the "outcry." I probably wouldn't have watched it either if my curiosity hadn't been aroused by all the protests about depravity and language. I did watch the show, and I enjoyed it. Personally, I can't understand what all the fuss is about - there was nothing in it that an intelligent person would either take seriously or be offended by. It was a disgrace. The BBC haven't just crossed the line, they sped over it at great speed in a Ferrari. As it happens, I didn't find the Opera absorbing enough to keep me watching for the whole two hours, but I did find what I saw quite interesting musically and in no way shocking. Was the BBC right to broadcast? Yes, in my view. It is refreshing to find something of real cultural interest in view of the usual diet TV feeds us. If being in good taste was the only criterion, most innovative art would never have been available to the public. In any case, we must be wary of freedom of expression being stolen from us by self-appointed watchdogs. Fantastic production - it says a lot for innovation and artistic talent in this country. What is wrong with freedom of speech and humour? The Jerry Springer Show came off pretty poorly I thought. Didn't we go all through this before with the Life of Brian? Keep up the good work BBC. I decided to watch to see what the fuss was about. What a brilliant show, superbly acted/sung and well produced. Thank you BBC for having the courage to broadcast this. It will be interesting to see what the viewing figures are like. Regarding the swearing, I think the BBC broadcast far more swearing during the football on BBC1 in the early evening, 30,000+ crowd all using the 'f' word, clearly and loudly. Any complaints that the game was to be shown? The second act was blasphemous and I can understand the objections from people of faith, but I thought this was the point that the writers were trying to make in satirising the JS show - that on these programmes you have a perversion of the truth and all decency is crushed for the sake of entertainment. I also wonder if the writers would have been quite so cavalier in their portrayal of a major religious figure if they had portrayed one of the gurus or prophets of another world religion in the place of Jesus, or whether the BBC would have broadcast the programme in such circumstances. I saw a bit of Jerry Springer - The Opera. I found it very boring, and switched off, so on that score I do not believe it should have been broadcast. On the matter of blasphemy, I do not believe blasphemy should be a cause for stopping any show, no matter which religion it offends. If you are strong enough in your belief, people who do not believe can't offend your belief. As long as this is equally enforced to any show, of any religion.